You are purchasing a personalized themed T-Shirt. 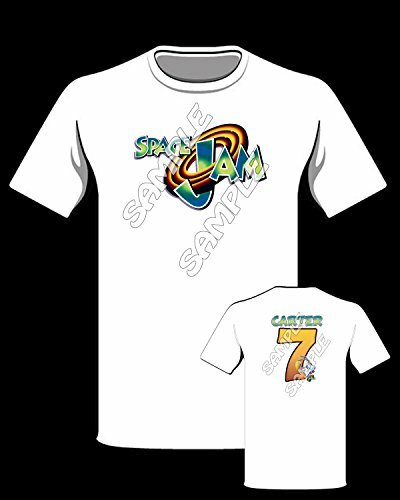 The back of the t-shirt can be printed with or without the persons name and with or without the persons age or desired number. (your choice) Please make sure to let us know what name and number you want on the back of the shirt. SHIPPING PROCESS We process your order the same day or the next morning and Ship either the same day or the next morning. Please contact us if you have something else you are looking for as we are always willing to get creative. COPYRIGHT We will inform to you that: ▸ This listing is for our creative service and time spent designing and personalizing your item. ▸ All copyrights used belong to their respective owners and are not being sold, only the graphic design efforts of the personalizing. ▸ All designs are created byModdCo. (aside from licensed character images or trademarks). ▸ All items purchased are for personal use only. ▸ Prohibited commercial use or resale. Brand: Modd Co, Personalized T-shirts and MORE! If you have any questions about this product by Modd Co, Personalized T-shirts and MORE!, contact us by completing and submitting the form below. If you are looking for a specif part number, please include it with your message.